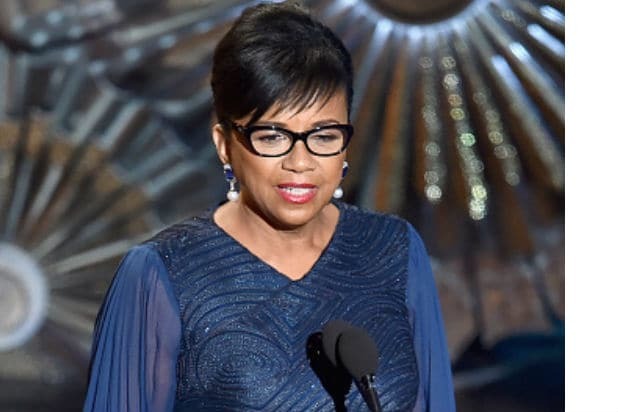 Academy of Motion Picture Arts and Sciences president Cheryl Boone Isaacs used her moment on the Oscars to address free speech in a year that saw a crippling studio hack and a devastating shooting at French newspaper Charlie Hebdo. Introduced by host Neil Patrick Harris, Isaacs took the Dolby Theater stage and applauded the diverse landscape of contemporary film — though she never directly addressed the race issue shrouding this year’s awards, which spawned the hashtag #OscarsSoWhite and even gave Harris fodder for his monologue. “We have a responsibility that no one’s voice is silenced by threats. A responsibility to protect freedom of expression,” Isaacs said, a nod perhaps to the attack threats on American theaters who agreed to show Sony’s North Korea comedy “The Interview” and possibly the 12 victims killed in at French satirical publication Charlie Hebdo. “At the Oscars, we celebrate our love of movies, and in doing so, we honor filmmakers who cross borders and test boundaries, … [those] who encourage us to see the world and those around us in new ways,” she said. Free speech resonated through the broadcast as well: the Edward Snowden-centered documentary “Citizenfour” nabbed Best Documentary Feature.